Creamy Spicy Wisconsin Cheese & Bacon Soup with spiced gouda, habanero jack, and sharp cheddar cheese with crispy bacon! An easy recipe that comes together fast! Cheese + bacon…. need I say more? 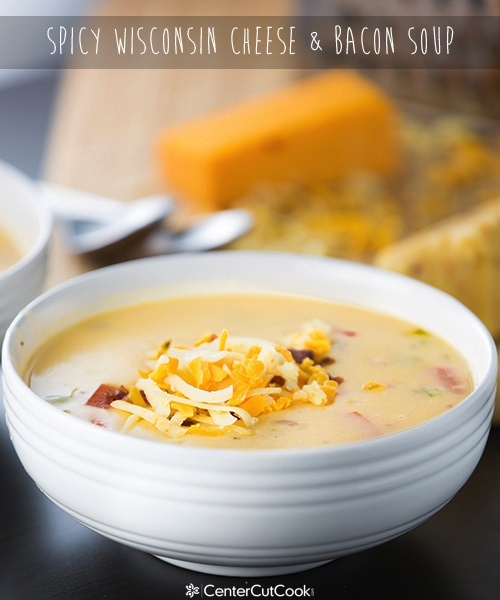 Soup week is coming to a close, so I decided to wrap it up with one of my most favorite soup recipes in the whole wide world: Spicy Wisconsin Cheese & Bacon Soup! 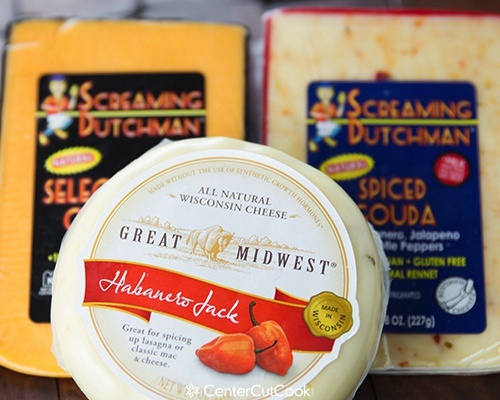 I grew up just a hop, skip, and jump away from Wisconsin, so I learned at a young age that Wisconsin is ALL about delicious cheese! I’ve been told that Wisconsin produces hundreds of varieties of cheese, which for this cheese lovin’ fanatic, is mind blowing! It also means that I need to step up my game when it comes to trying new cheese! 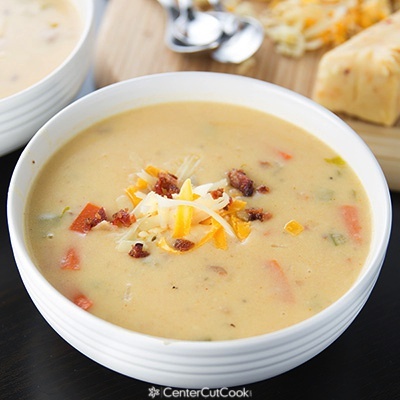 It was difficult to decide which cheeses to include in this Wisconsin Cheese Soup recipe, just because there were so many delicious options! In the end, here’s what I went with: Habanero Jack, Spiced Gouda, and a classic sharp cheddar cheese. All made in Wisconsin. Now, of course, if you can’t find the specific cheeses that I used, no worries. Feel free to substitute any cheeses that you’d like. You’ll need about three cups of cheese total. I’d recommend that at least one cup is a sharp cheddar cheese, but other than that, choose any cheeses that sound good to you! One of my favorite parts about this soup is the smoky bacon! If you don’t have bacon on hand, another great option might be ham or even smoked sausage. Of course, you could eliminate the meat altogether if you’d like to make this a meat-free soup. For me though, the bacon is half of what makes this so delicious! Helpful tip: Shred your own cheese. 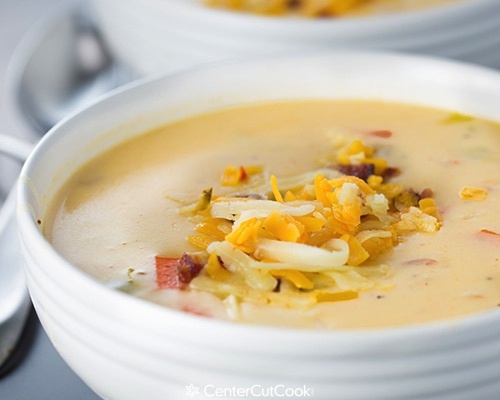 In a recipe like this where you want the cheese to melt right into the soup, it is best to shred your own cheese because it simply melts better than the pre-shredded packaged cheese. The consistency of this soup is not super thick like you might expect. The base of it is equal parts chicken stock (use vegetable stock if you wish) and milk so you’re left with a slightly thick, but not too thick soup that is comforting for the soul. This easy recipe comes together fast! It’ll take you about 15 minutes to prep – including chopping up the carrots, celery, and onion and shredding the cheese, and then it’ll take about 20 minutes to cook. 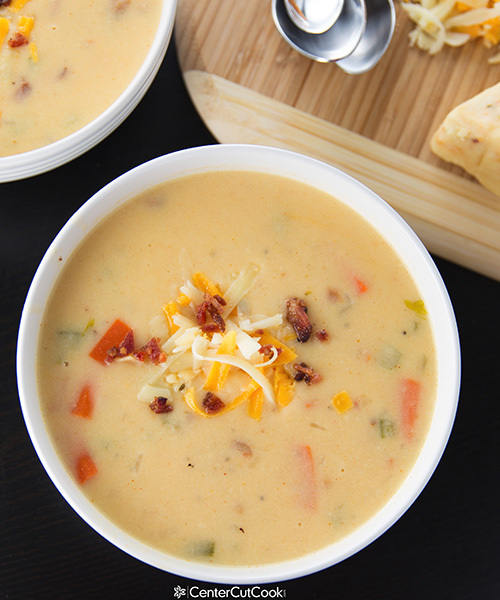 Within 35 minutes, you’ll have a deliciously cheese soup on the table for dinner! Enjoy! Melt 5 tablespoons of butter in a large stock pot over medium heat. Add in chopped carrots, celery and onion and cook for about 10 minutes, or until the veggies are fork tender. Sprinkle 1/2 cup all-purpose flour and 2 tablespoons corn starch over the veggies and stir to combine. Cook for 2-3 minutes. Slowly add in 4 cups chicken broth and stir well. After a few minutes, this mixture will start to thicken. Slowly add in 4 cups of milk, crumbled bacon, paprika, cayenne pepper, salt, black pepper, red pepper flake, and hot sauce. Cook for several minutes. Add in the cheese, one cup at a time and stir well between each cup. 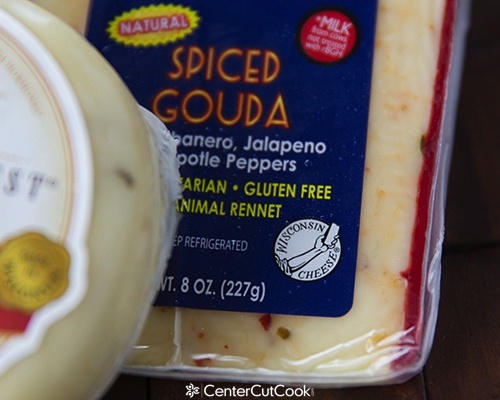 When all of the cheese has been added, reduce the heat to low until the cheese has melted. Adjust seasoning to taste and serve immediately.